Losing their tenth straight in the ’70 opener, WSU lined up against Idaho in the so-called “Displaced Bowl” as both teams were without home stadiums for the year. On April 4th Washington State’s stadium had suffered severe fire damage that wiped out the south stands and press box. Idaho’s Neale Stadium had been condemned and their new domed home would not be ready for at least another year, thus both teams played at Spokane’s Albi Stadium as their home field. WSU finally broke their losing streak with a solid 44-16 win over their “other” rival but they weren’t close in most of the remaining games and again finished with one victory. All Conference guard Steve Busch provided the highlights and RB Bernard Jackson, a Pierce JC transfer became the main rusher by mid-season. Placekicker Don Sweet became an “accidental discovery” and one of the Coast’s best kickers after the football staff saw him making one tremendous punt after another in the field house. Though the team’s success was lacking, their uniforms looked wonderful and the new look was topped off with a crimson helmet that featured a one-inch black center stripe and three-quarters-of-an-inch white flanking stripes. A new white logo, a large “W” with the word “STATE” through its center became an immediate fan favorite. The team finally turned the corner in 1971 though their 4-7 mark did not move them into the “winning season” column. The ground game behind All PAC choices guard Steve Busch and Bernard Jackson was solid with its Option Offense. Jackson turned in 1189 record setting yards and fourteen TD’s and then went on to a nine year NFL career as a DB with the Bengals and Broncos. Big wins included Minnesota and Stanford, the latter on a field goal from All Conference kicker Don Sweet with no time left on the clock. Sweet went on to a lengthy career with Montreal of the CFL. 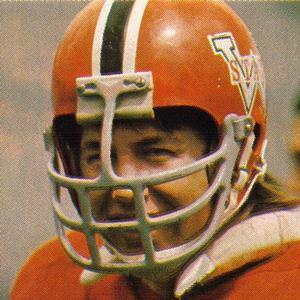 QB Ty Paine could run or pass, setting a school career total offense record and when he did pass he often found flanker Brock Aynsley who had an eight year CFL career. All Conference DB Ron Mims and Sophomore All American LB Tom Poe paced the defense. Some power on the O-line behind All PAC picks T Bill Moos and G Steve Ostermann allowed for an improved ground game in ‘72, and an offense that let down only against USC, providing Sweeney’s only winning record at 7-4. Ty Paine again led the option attack with help from RB Ken Grandberry who totaled 1459 rush yards his first two seasons. LB Poe was a Second Team All Conference choice and Joe Danelo handled the place kicking as an excellent replacement for the departed Sweet. 1973’s 5-6 record was a fall off from ’72 but again Ostermann, an All PAC honoree, led a tough offensive line. Center Geoff Reece joined him for “All” honors, allowing FB Andrew Jones to run for 1059 yards and HB Grandberry to graduate having set a new WSU career rushing record before playing with the Bears in ‘74. The defense was spotty but anchored by All PAC LB’s Tom Poe who later played in the CFL for a few seasons and All Coast Greg Larsen. DB Morris Noble used his track speed to get two years in the CFL. All Pacific Coast pick Danelo remained one of the nation’s best kickers. 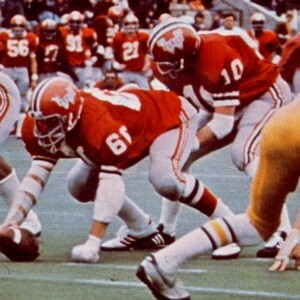 1974’s Cougars featured Steve Ostermann at guard and Geoff Reece at center as offensive leaders, All Conference choices, and Reece also an All American who managed two seasons in the NFL. Despite losing four games by a touchdown or less and suffering a large number of injuries, the team’s 2-9 record reflected inconsistent performance on both sides of the ball. Jones left as one of the Cougars best running backs. Losses to Ohio State 42-7 and USC 54-7 were especially painful though Larsen stood out as an All Conference performer at LB. Danelo went on to a ten year NFL career, best known for his superb work with the Giants. Despite a new 5-2 Defense for 1975 and two opening wins on the road, the Cougars dropped seven straight and did not win a conference game. For the first time in years, WSU did not post an All Conference offensive lineman and the rush game fell off despite the presence of top runner Vaughn Williams and tough varsity wrestler FB Dan Doornink who was given a try at QB and then played part of the season with broken ribs. Brian Kelly hauled in twenty-eight passes but the star of the team was All PAC punter Gavin Hedrick who unfortunately had a great deal of opportunity to ply his craft. The finale against Washington was a disaster as what should have been a safe lead evaporated into a bitter 28-27 loss. The hate mail that followed moved Sweeney to resign. With his former Montana State AD now at Fresno State, he was quickly hired and did a great job there, reenergizing the football program and winning 143 games.